For every woman the application of various beauty treatments no matter how painful is to enhance the physical appearance and attractiveness. To change her looks after a certain period is what most women wants as being fair does not always work according to their mood. Spray Tan is the next best thing. This is where, when one enters a booth they get sprayed with a shade that leaves the skin looking tanned as though one is just out on the beaches of the Mediterranean. Today most women don't like hair on their private parts. Brazilian Waxing is the best way to remove those unwanted hair from the private parts of one’s body safely. 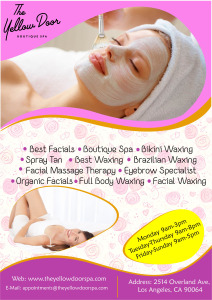 The Yellow Door Boutique Spa is the leading Best Spa offering all the necessary services from Organic Facials to Bikini Wax at affordable rates.